Camping is a fun and unique outdoor experience that can be enjoyed by people of all ages, but there are a couple of things that can frustrate new campers that are new to the hobby. One such issue is temperature. During the summer in large parts of the US, camping becomes a sweaty experience and it’s important to look at ways to reduce your body temperature to make your surroundings more comfortable. The other potential related issue is sunlight. Depending on where you camp, a cheap tent could let in far too much sunlight, causing you to wake up as soon as the sun starts to rise. This can cause issues if you’re a light sleeper and if you’re camping out in flat land. Your tent can heat up and let daylight flood in earlier than you might think. 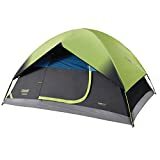 For the reasons above we’ve decided to review the Coleman Sundome Tent. This specific model incorporates dark room technology and this aspect is the main focus of our review. We’ve previously reviewed the standard 4 person Sundome tent here, as well as the 3 person and 6 person models. Also if you’re new to blackout tents then read our full buying guide. Summary An inexpensive option for up to 4 persons that does it's USP well. Why get a blackout tent? Blackout tents are designed to keep sunlight out of the tent. This help to keep the inside cool while also blocking out sunlight so that you can sleep in, if you wish, and enjoy yourself rather than struggling with the beaming sunlight. When looking for a blackout tent, you generally look for the same things that you normally would for a regular tent. This means that it needs to be the right size for you, it needs to be waterproof, it needs to be relatively easy to erect and put away, and it should be portable enough to carry with you when packed. The Coleman Sundome Tent ticks all these boxes and is spacious enough for four people, albeit 4 large adults might be a push. It also comes with all the setup equipment you need and it also has plenty of ventilation that make it perfect to keep the heat out. The one thing that differentiates a dark room tent is how much sunlight it can absorb. The Coleman Sundome Tent is advertised as being able to block 90% of sunlight which sounds pretty good. In reality, we can’t really tell how much “90%” of the sunlight is especially when different factors like the time of day can affect how much light enters your tent, so this is something that you have to try and see for yourself. On the plus side it does what it’s intended to do pretty well and that’s lowering the temperature inside while also keeping out bright lights so you can sleep in for a little longer. The Coleman Sundome is noticeably cooler during the day. Bear in mind because the tent is darker all the time you might occasionally struggle to find that vital item of gear you’ve stored in your tent. Ensure you have your torch to hand. It also comes with a lot of extra storage space around the inside of the tent, and even has access for cords so that you don’t need to open your tent to access power and plugs. On the negative side the poles and stakes do seem a little on the fragile side. So if you’re particularly rough with them, they could see a bit of damage so you may want to invest in a better set if you plan to use it a lot. The tent doesn’t come with a tent footprint which is vital in protecting the bottom of your tent. Though this is perhaps expected at this price point. This means you’ll need a small extra purchase. We don’t recommend camping without a footprint because it protects an essential component of your tent and also stops water from penetrating the bottom of the tent. The Coleman is also advertised as being able to sleep four, but we feel that this is only the case if it’s two adults and two children. Trying to fit four grown adults in here might be a struggle and you’re not going to have much space to move around. Conclusion – Do we rate the Coleman Sundome with Dark Room Technology? 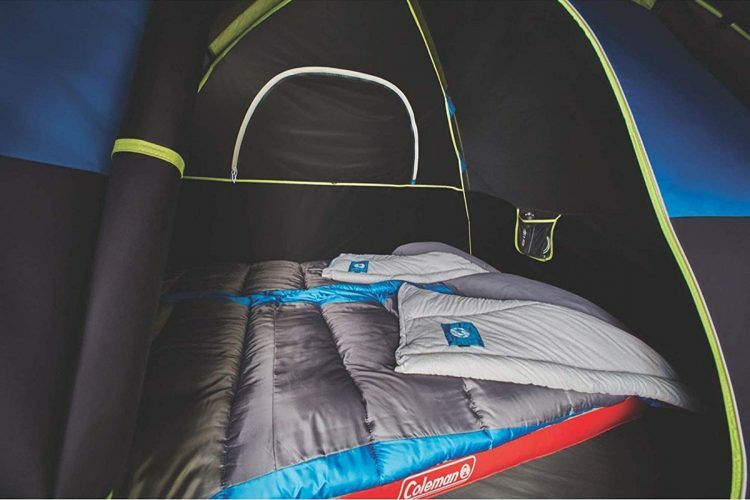 Overall, the Coleman Sundome Tent with dark room technology is a great option for summer camping when the temperatures are high and the sun is out for most of the day. It offers excellent shelter against the sun and weather, but it is a touch on the small side if you’re trying to fit the advertised four people inside. It offers plenty of ventilation but this means it can get chilly at night if you’re not wrapped up in several layers. 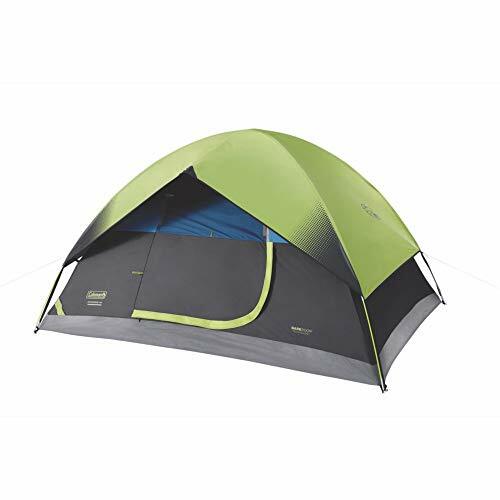 In short, this is an excellent tent that does everything you need it to. However we do recommend being careful with the stakes and poles and also purchasing a decent tent footprint.